AUSTIN, Texas , April 27, 2012 /PRNewswire/ -- Presented today by Tribeca Film Festival co-founder Craig Hatkoff, in association with renowned Harvard Business School Professor Clay Christensen and the Disruptor Foundation , Hanger Clinic's Vice President of Prosthetics Kevin Carroll, MS, CP, FAAOP and Area Practice Manager Dan Strzempka, CPO were honored with a Tribeca Disruptive Innovation Award. Carroll and Strzempka received the award for their innovative prosthetic work with Winter, the amputee dolphin at the Clearwater Marine Aquarium , and the resulting WintersGel™ prosthetic liner that is now benefiting thousands of amputees worldwide. "We are honored to have our clinicians' clinical work celebrated by such an esteemed organization as the Tribeca Film Festival ," said Hanger CEO Thomas F. Kirk. "At Hanger, we believe inspiration for innovation can present itself in unexpected ways. Motivated to help a young dolphin in need, Kevin and Dan's compassion led to collaborative ingenuity that resulted in a prosthetic solution that is now providing comfort to thousands of our patients. We are proud of their dedication, creativity, and continuing commitment to enhancing physical capability." Recognized across many fields for dramatically changing the world we live in through innovation, the venerable and diverse list of 2012 honorees also includes Jack Dorsey, founder of Twitter and Square; John Wood, founder of Room to Read; pop superstar Justin Bieber and manager Scooter Braun; founder of Def Jam Records producer Rick Rubin; and oncologist Steven A. Curley for his advances in cancer treatments. Hosted by the NYU Stern School of Business , the 2012 Tribeca Disruptive Innovation Awards were held today as part of the Tribeca Film Festival , which runs April 18 to 29 .
http://www.tribecafilm.com/news-features/2012_Tribeca_Disruptive_Innovation_Awards_Honorees.html and follow @TribecaFilmFest for updates about #TFFDisrupt. MEDIA NOTE: High-resolution photos and b-roll are available upon request. About Hanger – Hanger Orthopedic Group, Inc. (NYSE: HGR), headquartered in Austin, Texas , is the world's premier provider for services and products that enhance human physical capability. Founded in 1861 by James Edward Hanger, the first amputee of the Civil War, Hanger provides orthotic and prosthetic patient care services, distributes O&P devices and components, and provides therapeutic solutions to the broader post-acute market. After a six-month celebration of its 150th anniversary, on February 1, 2012 Hanger unveiled a comprehensive new brand identity to position the company for the future. Subject to shareholder approval at the Company's annual shareholder meeting in May 2012 , the new brand includes renaming the parent company from Hanger Orthopedic Group, Inc. to " Hanger, Inc. ", and referring to the patient care business as "Hanger Clinic" (formerly Hanger Prosthetics and Orthotics). For more information on Hanger, visit http://www.hanger.com/ and follow us at www.Facebook.com/HangerNews and www.Twitter.com/HangerNews. SOURCE Hanger Orthopedic Group, Inc.
Hanger Clinic's Vice President of Prosthetics Kevin Carroll, MS, CP, FAAOP and Area Practice Manager Dan Strzempka, CPO at the Tribeca Disruptive Innovation Awards. 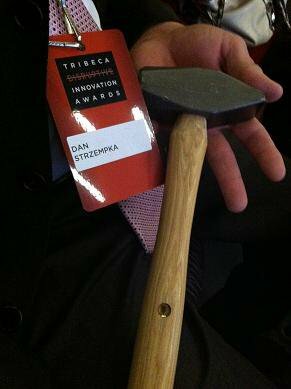 The hammer Carroll and Strzempka received at the Tribeca Disruptive Innovation Awards so they can continue disrupting.